In this edition of the SA parkrun newsletter, we continue to see large numbers of people joining the parkrun community, as well as lots of people enjoying parkrun tourism. We hear the remarkable story of Aiden Connold, who has completed eleven parkruns at Modderfontein Reserve parkrun after spending 2.5 months in an ICU. We also hear from a family who have all joined the 50 club. The arrival of spring has not only brought warmer weather and more sunshine to our parkruns but it has also brought with it a marked increase in registrations and participants. This increase has happened despite the fact that we have started no new parkruns in September. While some of us have been content to run at our home parkruns, a number of parkrunners have used the kinder weather to visit other parkruns. I visited Piggly Wiggly, Root 44 and Naval Hill parkruns. All three are superb parkruns and have grown into important contributors to their respective communities. I know that the South African parkrun tourists have been busy visiting parkruns as far afield as Lebone, Mogol and Ballito. Werner Morkel-Brink, Hartenbos parkrun event director, ran at Krakow parkrun in Poland and the Blounts from Voortrekker Monument parkrun have been running parkruns in Denmark. The Roodepoort Raiders “raided” Kraalkop parkrun last Saturday and this photograph of their run must be one of the most amazing parkrun photos ever taken. I intend to visit more parkruns in the next few weeks, when not busy attending parkrun openings and I look forward to some very special runs. This weekend I will be attending the country managers’ conference in Cork, Ireland. At this conference the leaders of all 11 parkrun countries gather to exchange ideas, strategize, but most importantly to keep the parkrun experience the special one we all enjoy no matter where in the world we are running or walking. Oh and we will be running the inaugural Cork parkrun…on Saturday 26th September. We drew breath in September but next month we will welcome new parkruns in Wellington, Pongola, Cape Town (Constantia Green Belt) and Hermanus. Good luck to all Cape Town Marathon runners! On Sunday, 20 September 2015 thousands of runners will be taking to the streets of the Western Cape for some fitness fun as part of the 2015 Cape Town Marathon. Will you be one of them? If so, we wish you the best of luck. If you aren’t already a member, you still have time to sign up for Team Vitality in order to get 50% off your race registration fee paid back to you upon completion of the marathon as well as access to our VIP hospitality on race day. For final race prep, follow our ambassador Elana Meyer’s last minute training advice: Thursday rest; Friday 20min Easy pace with 4 x strides; Saturday10min easy jog, 5 x 30s fast with 1min rest. Sunday: Cape Town Marathon! Our training programme for the last few days before the 10km race: Thursday 10 times 1min run 1min walk = 20min; Friday rest; Saturday Easy parkrun or rest; Sunday10km at CT Marathon. Welcome back to Robert Boulle, the lucky winner of the Team Vitality parkrun competition, who really had a fun-filled adventure with his wife in Australia. Aiden Connold succeeded in her goal of completing the 5km parkrun in less than 1 hour on 22nd August 2015. To understand why this was such an important goal, you need to understand the challenge. Aiden was involved in a motor vehicle accident in April 2014. She suffered a traumatic brain injury in the accident and spent 2.5 months in ICU. The accident left her with paralysis on the right hand side of her body and until December 2015 Aiden was not able to walk unaided. 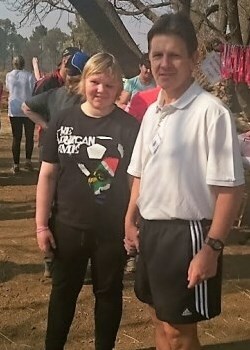 After months of therapy and dedicated exercise, Aiden finished her first parkrun on 18th April 2015. Unfortunately, as she was not registered, this walk did not count. She did the walk with the aid of her father (holding her hand) and a walking stick. Her second walk, which was the first official walk was completed in 1 hour and 24 minutes. Over the past three months Aiden has completed walks every weekend, if not at parkrun, then on weekends away in the Drakensburg and she even managed to complete the 8km 702 Walk the Talk. On 29th August 2015 she did her first completely unaided walk, with no walking stick and no hands to hold. She completed this in an unexpectedly fast time of 1 hour 8 minutes and 31 seconds. Her next challenge is to finish a parkrun in under an hour walking unaided. We would like to thank parkrun and their volunteers for providing a safe area for Aiden to complete her walks and for their patience in waiting for her to finish when she was coming last. Their encouragement and the timed record of her achievements have been a huge encouragement to Aiden in her recovery. On 12th September 2015, Adri Gerber became the first Limpopo-based female parkrunner to join the parkrun 50 club. She became only the fourth parkrunner at Mogol parkrun that can now wear the much sought-after red t-shirt. 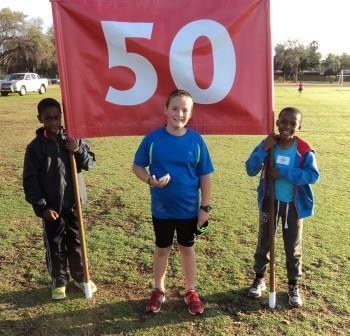 The other 50 club members at Mogol parkrun are Neels and Divan Gerber and Andre Stevens. Divan was the first junior and Neels the second male from a Limpopo-based parkrun to join the 50 club, Andre Stevens was the first male. Neels is Event director at Mogol parkrun and both Divan and Adri are regular volunteers as well. Although a junior, Divan assists with the pre-event setup at Mogol parkrun every morning at 06:00 (Mogol parkrun starts at 07:00). This achievement highlights the fact that the whole family can enjoy taking part in parkrun. They don’t have to be serious athletes and can just use the parkrun as a fun activity to enjoy a Saturday morning exercising together. The Gerbers have completed thirteen different parkruns and are keen to complete as many other parkruns in SA as possible. 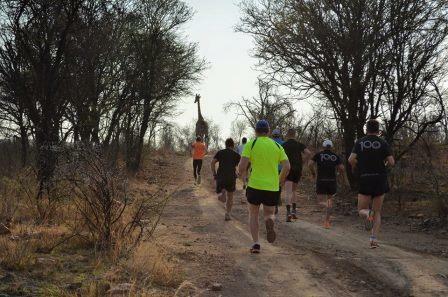 Being based in the Limpopo province makes this more of a challenge than for parkrunners in other parts of the country, but we have our sights on running many more different parkruns! 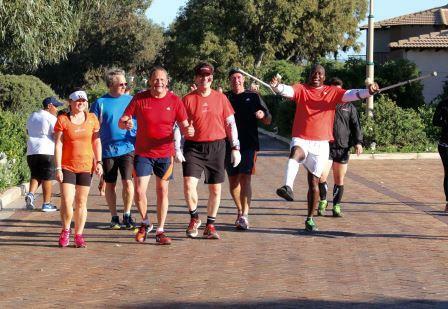 In this edition of the SA parkrun newsletter, we welcome lots of newcomers to the parkrun community, see the launch of Langebaan parkrun and hear the story of Jabu, who has not allowed a foot injury to prevent him attending every parkrun in the country. It is also the final week of voting in the best running event 2015 in Poland, where parkrun could take the title with your help. Spring has arrived early in some parts of South Africa and as a result our attendance and registration figures have grown considerably. Last week more than 3000 newcomers registered for our 63 parkruns and over 16,500 participated. I need to remind our Gauteng based parkrunners however that it snowed heavily on September 10th 1981! So don’t pack away the winter woollies yet. Spring is the perfect time to visit the Cape West Coast, as in good seasons the spring flowers are breathtaking. 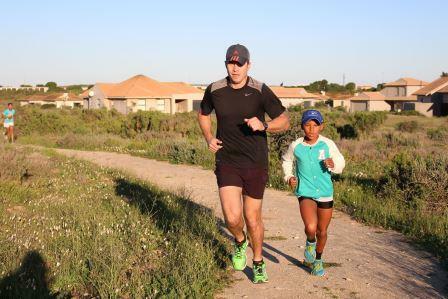 Langebaan parkrun on the West Coast could not have timed its launch better as the fynbos and its flowers were in full bloom to greet the runners at the first Langebaan parkrun. 160 eager parkrunners from the community as well as several parkrun tourists tackled the fast, flat route which winds its way through the flowers and past idyllic dams full of water fowl. The general consensus afterwards was that Langebaan parkrun is one of the most beautiful parkruns to run and is also lots of fun. Congratulations to Chantal Van der Nest and her team for all their hard work and their perseverance in establishing this parkrun. Langebaan parkrun is our last new parkrun for a few weeks as we relax and catch our breath. So there will be no new parkrun launches in September. We look forward to a busy October. As we all understand, parkrun welcomes runners and walkers of all abilities but it is also very exciting at times to see talented runners at our various parkruns. 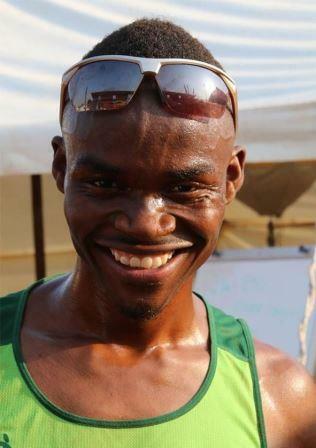 Folavio Sehohle’s progress at Halls parkrun in Nelspruit is one such example. This gifted runner has run Halls parkrun in under 15 minutes and is now a regular contender in road races around the country. 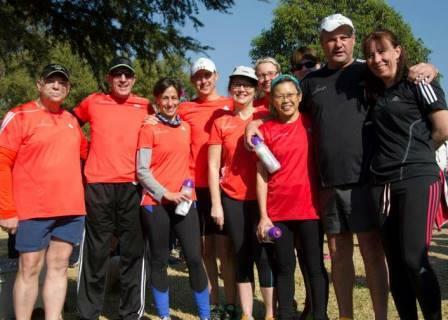 “I can still recall the excitement in the news that the parkrun concept had finally come to the Southern suburbs of Johannesburg. The course and venue at Rietvlei farm is simply spectacular; this is testament to the consistent weekly turnout. In the warmer months there are in excess of 1000 parkrunners and that’s not counting our loving canine friends that are also welcome and allowed to run or walk next to their owners. The enthusiasm and excitement is evident in all, from toddlers up to our senior participants. Whether trying to break the course record or just gaining the health benefits of this basic exercise run/walk ‘parkrun’. 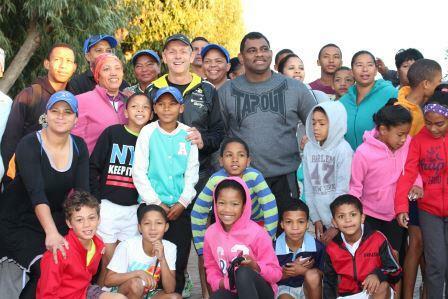 The Rietvlei parkrun has become one large family, getting together for one common cause; to exercise, draw positive energies from each other and be healthy. It’s a stunning route, all off road in tranquil surroundings with a view of lakes and the trout pan. As you head to the finish, crossing a small stream, you’ll be urged on by a gaggle of geese that have taken residency in the farm. They certainly get very excited when we all run pass them. Being a competitive runner I can say that this parkrun has undoubtedly enhanced my competitive edge especially in the cross country league races currently on the go. I’m going to take the liberty in saying that I speak for most Rietvlei park runners in thanking Bruce Fordyce for having the vision to identify Rietvlei as a parkrun destination. As well as Shawn Mackrell and his friendly team of volunteers that pitch up every week to make this healthy experience so much more comfortable and exciting for us all. 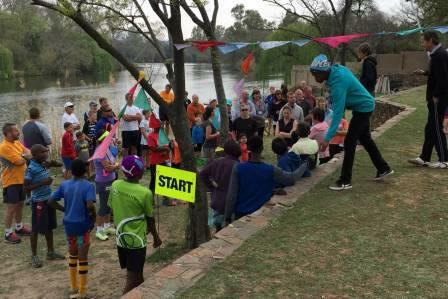 I urge every parkrunner near or far to come and share in the friendly, warm atmosphere of the Rietvlei parkrun”. We know that as parkrunners, your health is important to you, and eating well is just as important to staying healthy as being active is. Nutrition labels on packaged foods are meant to educate us, but many of us struggle to interpret them. To help, Vitality in partnership with The George Institute for Global Health has launched a cutting-edge, free mobile app that will change the way you look at food, anywhere, anytime! The HealthyFood Switch app offers easy-to-understand information about packaged food products. Simply download it from the App Store or Google Play Store then scan your product’s barcode with your smartphone camera. The app will then rate your product’s salt, sugar, fat and saturated fat content and also give you a handy overall health rating. This will help you make fast but informed decisions about what you buy. HealthyFood Switch also suggests healthier alternatives to your product. So revolutionise the way you shop and be one of the first to try this exciting new app. Download it today and you could WIN your share of 200 weekly prizes valued at R500 each. On a beautiful winter’s morning, Albert’s Farm parkrun celebrated its first birthday. Mike Tippett was on hand to welcome the parkrunners and had lots of giveaways to hand out. The anniversary celebrations saw a record turnout of 376 parkrunners who came to enjoy their Saturday morning 5k and share stories of the impact parkrun has had on their lives. adidas joined in the fun, offering parkrunners the opportunity to try out their shoes and they even sponsored a pair of shoes for one lucky person. As part of the festivities, the usual course was run, but in the opposite direction. This drew mixed reactions from parkrunners, and lively discussion on which direction was more challenging. It is the last week in which parkrunners across the world can support our parkrun community in Poland in winning the title of the best running event of 2015. Over the last few weeks parkrun Poland have made significant progress and got to the top three events of the 2015 Poland best running event award. The award is the most valuable title in Poland and winning it would be a very significant achievement of the Polish parkrun community, allowing them to appreciate the involvement of thousands and securing its sustainability in the coming years. Let’s support our friends in Poland, who are part of our global parkrun family, in becoming the best running event in their country! Votes can be given via the website by 9 September. Fields marked with * are mandatory. In order to vote, please take the following steps: (1) Select ‘parkrun polska’ from the list under ‘Biegowe Wydarzenie Roku! *’ (Best Running Event), (2) Give your email address (a confirmation email will be sent. (3) Type in the verification code (Kod weryfikujący). You can request a new code by clicking on ‘Pobierz nowy kod’, (4) Once the vote has been registered you need to click the link sent to your email address to confirm the vote. You can only vote once. The award is sponsored by PZU Zdrowie, an insurance company that is also our main sponsor in Poland. The information provided at the bottom of the form is a short description of the company and their involvement in supporting running in Poland. I would like to honour my great parkrun friend Jabulani Mkhize. Jabu has completed all 63 different parkruns in South Africa, one of only 4 people that have done so (Bruce & Gill Fordyce and myself are the others). He earned his black 100 parkrun t-shirt at Piggly Wiggly parkrun this last weekend. I first chatted to him at the Upington inaugural parkrun in March 2014, after recognising him from a few earlier events. At the first event in George during April he challenged me to get to a parkrun “full house”, which means we have since travelled all over our beautiful country. We completed 35 of his 100 parkruns together, of which 31 were inaugurals. We have also never run the same event together twice! Jabu had a muddy fall a few weeks ago at the Durbanville parkrun, injuring his foot. That did not stop him from completing the 5km. Nor did the resulting cast and crutches stop him from travelling to Soweto the next week for the start of the Mofolo parkrun. Or to Polokwane, Golden Harvest, Kraalkop or Langebaan the following weeks. He completes the 5km in under 60 minutes with his crutches! Jabu is known countrywide at events as the big man with an even bigger smile. He always has words of encouragement for fellow runners and walkers, especially the youngsters. His target is to complete all the different events at least three times (you’re on your own with this Boss! ), so expect to see him again at an event near you soon! Thank you for being a loyal supporter of the parkrun tourists Jabu, it is an honour to have you as a friend. We are all looking up at you in admiration. All the best to the recovering foot Jabulani. 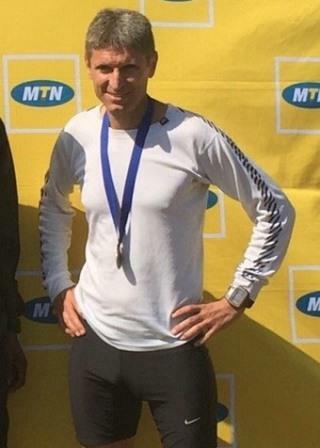 See you at a parkrun soon my bra. Breakfast is on me!